Every day in Morocco potter’s hands mold the burnt orange clay, wheels turn and ceramic bowls bake in the heat. It’s a daily process. In the villages, woman head down to the river bank to dig the moist clay from the earth. Retracing their steps back home with full woven baskets. A heavy load. The clay drips. Water stains the dry dirt. 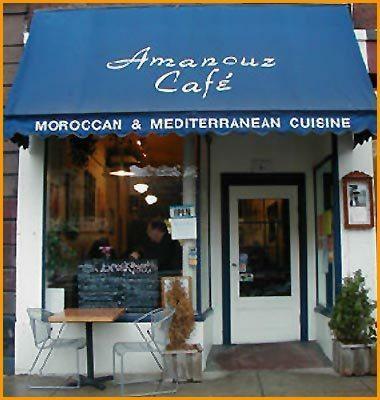 Morocco is well known for its wide range of ceramic pottery. The pots are generally used for daily life, a large number are bought by tourists, while others are exported over seas. Pottery also lines the souks, hand painted with fine detail, deep colors and a variety of hand spun designs. The city of Fes is known for producing high end pottery with an array of colors and sparkling glaze. Tamegroute produces pottery inspired by Fes designs. The kilns of Tamegroute are built into the steep slopes of the countryside. Tamegroute is known for its distinct green and brown glaze. Tamegroute has been a religious center since the 11th century. The Nasiriyya brotherhood brought the native techniques and green enamel from Fes to Tamegroute, assembling merchants and craftsmen to raise the status of the city. 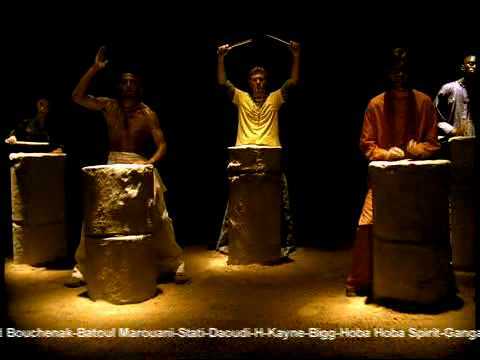 The pottery cooperatives is a great attraction for tourists visiting the Zagora region. Pottery is made and bought on the spot at the cooperatives. Some of the village roofs of Tamegroute and other regions are also tiled with the green ceramic clay. When the sunlight streams down, the green roofs glisten against the stone city. The green glaze is made from a combination of magnesium and copper. The ceramic pots and dishes with this glaze are waterproof. A trip to the pottery villages is a great way to get inside the local culture of Morocco, to experience some hands on work, and take home a sustainable and “green” souvenir. Moroccan carpets are famous around the world. In the West, the tightly woven beige Berber rugs are found in most modern homes, schools and offices. Although these rugs are stain resistant their dark flecks of brown and tan do not compare to the thousands of intricate designs and colors of the traditional Berber carpets of Morocco. Traditional Berber carpets contain distinctive patterns and colors and are woven from sheep wool or camel hair (you can also find them made from nylon and olefin material). The materials are hand-washed and naturally dyed from saffron yellow, to wild mint green, and from pomegranate and henna. These carpets are known for their strong geometric designs, and have been dated them as far back as the Merinid era. 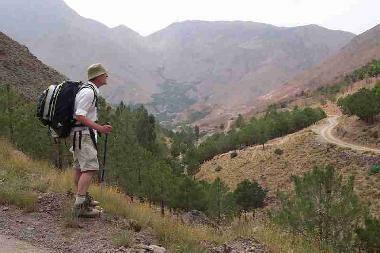 Carpets in the Middle Atlas generally have a traditional diamond grid. The Berber tribes developed a variety of weaves to be adaptable to different climates. The rugs in the mountains have larger loops, are more loosely knotted to provide protection against the cold. In warmer climates the rugs are made with a finer weave. The carpets in the Middle Atlas were used as sleeping mats, and in regions with mild climates knots tend to be 2cm high. Berber weaving is highly dependent on the female culture, and is passed down traditionally within the home. The young apprentice is expected to learn the the different looping techniques, patterns, color ranges and motifs. Historically women wove carpets for their families, and men traditionally produced carpets that were more specialized as professional masterweavers. These inspiring designs have been motivation for more modern carpet fabrication. Historically carpets where a preferred gift for people in elite social classes and where used to adorn palaces and other sacred places. The more urban carpets have also been used at prayer mats and rugs in the hammam. Travelers who are interested in Berber carpet weaving should check out the Weavers Cooperative, and the Berber Carpet Demonstration, a famous exhibition. Some ancient Haouz rugs are also preserved in museums such as the Dar Batha Museum. These intricate rugs can be purchased from the tribes themselves but also in the winding souks of Fes, Marrakech and Rabat. Carpets originating in the hills and plains of the Haouz region do not tend to follow traditional designs or rules. In this region, the weavers stress the freedoms of the individual throughout the composition. The carpets have a distinctive style and are often captivating works of art. The bold colors, in depth patterns and weaving techniques of different regions have their own distinct style. Each tribe has a signature pattern and commonly unfold a story, revealing acts of ceremony, or designs that often relate to fertility and protection. Like any other type of abstract art, interpretations can be better guided with additional knowledge of the culture, songs and legends. Donkeys hooves knock against the stone, while people scurry through the Medina, getting lost in the maze like streets. Something is different about Fes. Listen closely, there are no honking horns, putting motors or screeching brakes. That’s right, inside the fortified walls and labyrinth allies there are no cars. 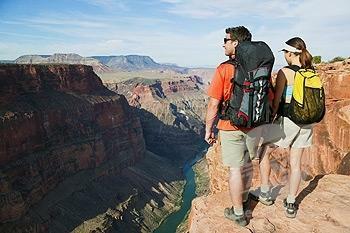 The best way to explore the city is by foot. Tourists should make sure to swing by the Dar Batha Museum, the home to Moroccan Arts. The display of handwoven Berber carpets, cobalt blue and ceramic pottery, embroideries, ancient astrolabes, and zelliges, elaborate mosaic and ceramic tiles, is a transport back in time. Make sure to check out the video above from the United Nations Educational, Scientific and Cultural Organization for World Heritage. 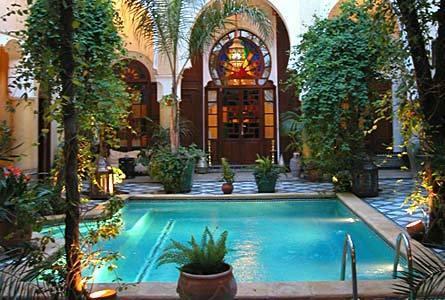 A riad is a very large traditional Moroccan home with architecture from the period of the Idrisid Dynasty. Riads commonly have rooms arranged around an interior garden or mosaic tile pool, with Arab style archways and detailed mosaics. The Dar Roumana is unique for offering an exclusive cooking lesson for their guests. Cooking lessons are usually scheduled as one day sessions with a trip to the souk to buy fresh ingredients for the meal. Lessons are offered on Tuesdays and Fridays, in both English and French. To enhance your stay host will arrange or book a visit to the local hammam, tee time at the Royal Golf Course, and car rentals. At the Riad Fes, guests can enjoy the Golf Escapade, with green fees that are included in the price of the stay. The Riad Fes also includes transfers to and from the airport, accommodation, green fees, transportation to the golf course, bed and breakfast, and guided visits and transportation. The riads royal suite is perfect for honeymooners looking for a romantic setting, with views of the garden and pool, and a private terrace overlooking the medina and Atlas Mountains. Rooms in the Riad Fes include a dressing area, bathrobes and slippers, a mini bar, fresh fruit, pastries and flowers. At the Hotel Sofitel Fes Palais Jamai guests are encouraged to take advantage of a soothing massage at the spa, free access to the fitness center, or a buffet style breakfast. Guests can enjoy the restaurants international cuisine or barbecue on the pool terrace overlooking the medina. The just after twilight the pool terrace has a a magical atmosphere with a horizon of city lights and towering palms. Exotic aromas of ginger, coriander, and cinnamon mingle in the streets. Fine mounds of spices tower like sand pyramids in the dusty souks of Morocco. Deep red paprika, vibrant yellow turmeric, beige sesame, green olives and lemons layer in eye catching patterns. 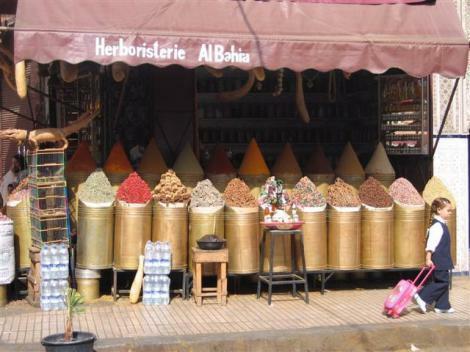 One of the largest markets for Moroccan spices is in Agadir. The spices are customarily displayed in metal tins, woven baskets or plastic tubs. Each dose is weighed individually and sold in a modest paper bag. Herb specialists in the souks have a wealth of knowledge of the medicinal benefits of the array of red, orange and yellow spices. Cumin, in between a rust and gold color, has been utilized as a stimulant, antispasmodic, carminative, sedative, digestive and also a remedy for colic and dyspeptic headaches. Saffron along with its pungent flavor and sharp odor is said to cure asthma, and some herbalists claim it contains anti-cancer properties. Cinnamon is known to have antibacterial entities and turmeric along with exhibiting strong anti-inflammatory and antioxidants also helps slow the process of food spoiling. While many spices were emported from the East they also originate throughout the Mediterranean and can be specifically found in Morocco. Saffron, which is often used when cooking white meats, poultry and lamb, is native from Tiliouine. Saffron is difficult to cultivate because it must be picked by hand, and for every one gram it requires 140 of the violet blue flowers. Lemons and oranges originate in Fez, and olives and mint derive from Meknes. Some other widespread spices are also home grown: cumin, cinnamon, turmeric, mint, pepper, ginger, paprika, sesame seed, anis seed, coriander, and parsley. 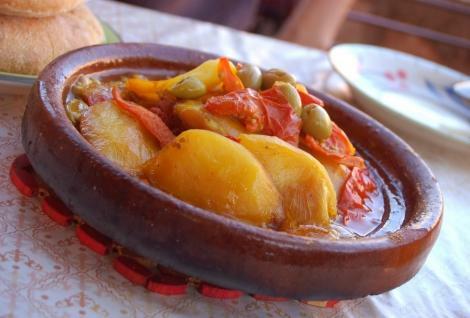 Spices are the heart of Moroccan cooking, and are crucial for making a couscous or a tajine, two popular Moroccan dishes, they are also used sparingly in many desserts. 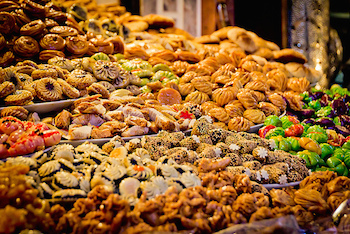 Halwa shebakia, a Moroccan delicacy, is a type of honey cake. 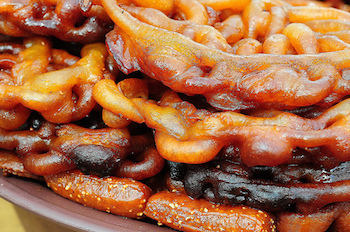 Its pretzel-like pieces of dough deep-fried and dipped into a hot pot of honey are then sprinkled with sesame seeds. The ingredients also include a teaspoon of turmeric and ground cinnamon. Saffron is also commonly used in desserts (milk, yogurt, puddings) and teas. Not only a breath freshener, mint is also served as an herbal remedy with soothing tendencies. Traditionally while Moroccans pour their tea they raise the steaming pot high above the glass, when the tea bubbles it insures its freshness. Mint tea is also customarily served in small shots. While negotiating prices in the souks, it is common that bargainers will be offered some mint tea.